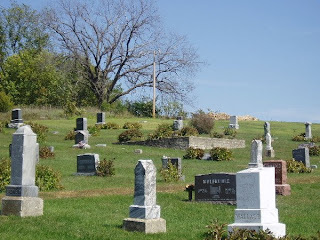 Second Sight: A Paranormal View: Stull Cemetery -Kansas Gateway to Hell? Stull cemetery is a small rural cemetery off a beautiful state parkway. Surrounded by quaint old buildings and hordes of cyclists, this off road plot of land seems quiet. Is it really a gateway to hell? The church on the property has a legendary past, that is, its past is mostly legend. Locals say that the building had been used by devil worshippers and other evil-doers and that they opened a hole to hell itself. 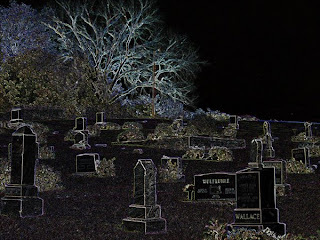 Trespassers tell tales of feeling powerful energy at the base of the stairs of the old church, and Halloween nights fill the cemetery with groups of people waiting to see The Legion itself. 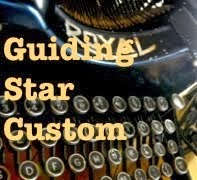 Prairieghosts.com shares this story. 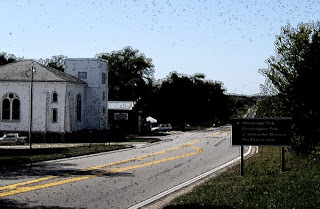 "In 1980, an article appeared in the Kansas City Times that added further fuel to the rumors about Stull Cemetery and the abandoned church. The article was quoted as saying that the Devil chose two places to appear on Earth every Halloween. One of them was the “tumbleweed hamlet” of Stull, Kansas and the other, which occurs simultaneously at midnight, is someplace on the “desolate plain of India.” From these sites, according to the article, the Devil gathers all the people who died violent deaths over the past year for a prance around the Earth at the witching hour." Now, the old church has mysterious been torn down, some say in the middle of the night to avoid problems with locals, and the cemetery is fenced off and marked "Private." That didn’t stop me and Norman from driving out there to investigate ourselves. We found the town of Stull, outside of Lawrence Kansas to be charming and peaceful. Beautiful in the autumn, we felt a bit out of place and conspicuous taking pictures of the cemetery off the main road. The crumbled church could be seen far off in the corner of the cemetery, and I must admit I did feel a weird energy about the place. Is it because of the devil himself or the amount of energy spent in this location by other ghost hunters… I don’t know. Check it out for yourself, but no trespassing! About 20 years ago while driving across country, I went a couple of hours out of my way to check out STULL. Supposedly it is the exact geographical center of the Continental US, and therefore a perfect place for supernatural shenanigans. The Old church was still up and I snapped some pictures, though they looked exactly like the CD cover of the Stull EP by rock band Urge Overkill. The place DID have a weird energy and was worth the stop...but I doubt the devil himself hangs out there...not enough night life! This is a strong claim that people would gather up there and do occult ceremonies (talk about "children of the corn"). Who know is these claims are true enough or fabricated by those who are bored with own lives. Such a shame that the church was abandoned and that the cemetery has been labeled with black propaganda. Scary. To think people would do ritualistic mambo-jambo in an abandoned cemetery is frightening. Reminds me of the twilight zone. FREEEEKY!